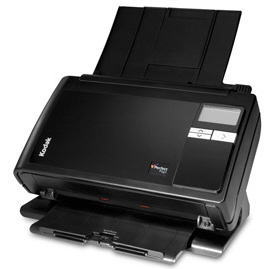 We have been using these scanner now for over a year and have not had any problems. The scanner is very quick and efficient and is perfect the our use. The customer service I received from Tradescanners.com was excellent, it made purchasing this scanner easy. Today's business runs on information. But when that information is on paper, it can slow you down. Get things flowing faster with Kodak i2600 and i2800 scanners. They let you extract critical information from documents at the point of entry, for quick distribution to decision-makers who need it. So money to be gained isn't left waiting for choices to be made. No matter what size your business or department is, the reliable performance of the Kodak i2600 and i2800 scanners can enable collaboration right from your desktop. They decrease processing time for information that needs to be shared for review, reference, approval and legal compliance reasons. This helps increase both internal and external customer satisfaction, and saves your company time and money. Plus, if your business has branch offices or field agents, distributed capture allows document images to be immediately sent to a central location for easy access. Help your company get ahead with a scanning solution that can bring you increased security, faster internal processes, better teamwork, and a host of other business benefits. More imaging power - Dual LED illumination means faster first scans, plus great image clarity, consistency and colour stability. More performance - With speeds up to 70 pages per minute, you get plenty of production in a small package. More flexibility - No matter what document you're scanning, paper handling from Kodak gets the job done. Small or large, thick or thin, ID cards, even embossed hard cards - the versatile, self-storing output tray easily adjusts! More automation - Kodak's Smart Touch functionality performs multiple-step scanning operations at the press of a button.